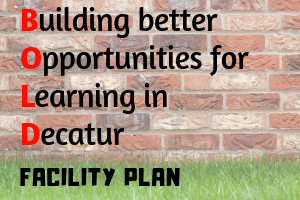 We're making BOLD changes in Decatur Public Schools' facilities, commencing the summer after the 2018-19 school year - changes designed to address building utilization, magnet school waitlists, and other capacity issues. BOLD will allow us to provide all students with an equitable learning experience no matter where they live and create a more sustainable future for District #61. CLICK HERE to provide feedback or questions relating to BOLD. Be sure to read our FAQ document!